Five O'Clock Shadow - More than 25 years ago (1991 to be exact), five guys got together to do some street singing. They started with simple doo wop and jazz harmonies. At a time when doo wop was considered “contemporary” a cappella, these five guys wanted more from vocal music. They began to experiment. They found ways to make drum sounds with their mouths and imitated instruments such as trumpets, harmonicas, and guitars. Eventually, imitation simply wasn’t enough. With the help of simple stomp pedals, they incorporated wahs, tremolo, phaser, flanger, and distortion into their arrangements. What began as a simple a cappella group morphed into a vocal powerhouse unlike anything the world had heard or seen before. 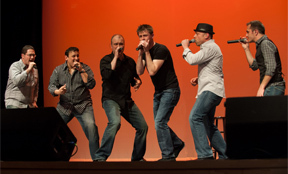 Audiences across the United States, Europe, and Asia have been witness to this revolutionary form of a cappella. FOCS has bred many of the world’s greatest vocal percussionists including Jeff Thacher, Wes Carrol, Samrat Chakrabarti, and David “Stack” Stackhouse. Their award winning album “Wonders of the World” was labeled as “one of the most influential CDs of the past decade.” This album garnered so much fame, the group was able to perform the title track as part of the “Wonders of the World Halftime Show” at the NFL hall of fame game in Canton, OH. They have toured with many famous acts including, but not limited to The Boston Pops, Aaron Neville, Edwin McCain, Patty LaBelle, Cool and the Gang, Blessed Union of Souls and James Brown. Over the years, members have come and gone, but one thing remains the same…they continue to maintain a high level of musicality and innovation.